Wheeling Jesuit University received a B+. Washington Monthly's ranking of 4 out of 346 of Baccalaureate Colleges - Overall Rank was a major contributor to this grade. The rigorous liberal arts curriculum of this suburban Catholic school is supplemented by a dedication to Jesuit values and ideals. Thanks to WJU's modest size, students can participate in several unique academic programs, including a handful affiliated with NASA. What are the top 3 reasons someone should attend Wheeling Jesuit University? The academics are incredible. Professors are great. It's close to Pittsburgh, so that's fun. The people are amazing. That's a pretty good reason. What is a typical Wheeling Jesuit University student like? Describe the type of person that should attend Wheeling Jesuit University. Any type of person can attend Jesuit. It is a great community that can be very inclusive. Recently more athletes have been coming in, but as long as you can find a few good friends you are good to go. 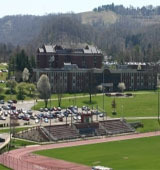 Wheeling Jesuit University (then Wheeling College) was founded in partnership between the Catholic Diocese of Wheeling-Charleston and the Society of Jesus of the Maryland Province in 1954. Wheeling Jesuit, the youngest of the nation's 28 Jesuit institutions, incorporated as Wheeling College on Sept. 25, 1954. Workers laid the cornerstone for Donahue Hall on Nov. 21, 1954. The College, staffed by 12 Jesuits and four lay professors, opened its doors to the first class of 90 freshmen on Sept. 26, 1955. Formal dedication ceremonies for Wheeling College were held on October 23, 1955 with more than 2,000 people in attendance. Archbishop John J. Swint turned over the deed to all college properties and buildings to the Maryland Province of the Society of Jesus on February 11, 1957. Wheeling Jesuit University is the only Catholic institution of higher learning in West Virginia, and has a special educational focus to seek and find God in all, in chapel and classroom, in liturgy and laboratory. What are the top 3 things that students do for fun at Wheeling Jesuit University? You can go to the dances at the Ratt, or any of the parties in the dorms. You can make a Sheetz run because you always need fried food. 26% of students received Pell Grants, which are provided by the U.S. government to students from middle and lower income families. It gives you an idea of a school’s socio-economic diversity. Campus housing is available for undergraduates. Housing deposit : $100.00. Housing deposit is refundable in full if student does not enroll.. Freshman allowed to have car. No pets. 65% of students live on-campus. 84% of freshman live on-campus. Any instructional program in Philosophy not listed above. A program with a general focuses on the general application of various combinations of mathematical and scientific principles to the analysis and evaluation of engineering problems, including applied research in human behavior, statistics, biology, chemistry, the earth and planetary sciences, atmospherics and meteorology, and computer applications. 46% of students graduated in the top quarter of their class. The average student pays $18,050 for tuition, fees, and other expenses, after grants and scholarships. Total stated tuition is $26,800, in-state and on-campus, before financial aid. Learn more about financial aid at http://www.wju.edu/admissions/finaid/default.asp. Estimate the net price for you at http://wju.studentaidcalculator.com/survey.aspx. 41% of students graduated on time. The typical (median) early career salary of Wheeling Jesuit University graduates is $33,700, according to Payscale. Wheeling Jesuit University participates in the NCAA Division II for college athletics. Want more info about Wheeling Jesuit University? Get free advice from education experts and Noodle community members.